After compiling my list of accomplishments for 2007, I worked on my list of things I hope to work on in 2008. This is what I came up with. I found six PIGS. 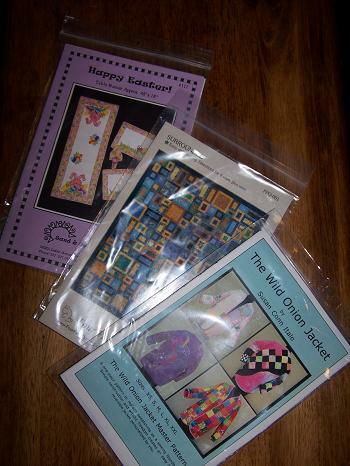 Four are actual kits, two are matching lap quilt patterns that I have fabric for, sitting in a sack. My WOBS pile (this is what I call those quilts waiting on binding) is the largest group of all. I rounded up twelve quilts, large and small, that need binding. I came up with five WIP’s. My Eleanor Burns nine patch & strips, my fall wallhanging, and old UFO with a big star in the center, a pink & white project that only consists of two completed blocks right now, and I’m counting my leaders/enders as a WIP. Those waiting to be quilted are my Storm At Sea, and some antique tops I bought on Ebay. I think there are five of those. Projects I haven’t started, but have the fabric for, and hope to complete this year are a log cabin for my Daddy, my batik jewel box, and a Darlene Zimmerman Boston Commons quilt in 30’s fabrics. A Turning Twenty for myself, out of my collection of chicken fabrics. And I still want to make these patterns. It will be interesting to me to see how close I come to meeting those goals, by the end of this year. One thing I was thinking yesterday, is that I think I try to rush through too many projects, putting pressure on myself to get them finished, and move on to the next one. I’m trying not to do that with the nine patch & stripes. I am trying to take my time and get back to enjoying the process, and my time spent with beautiful fabrics and threads. I’m also rethinking whether or not I want to quilt tops for others, or stay with only commissioned quilts. I’m leaning toward the latter. There a couple of ladies that I will quilt for, but I’m thinking that with the fulltime job I already have, I really don’t need or want the added pressure, at this point in my life. My little holiday from the real world officially ends in the morning, as I go back to the wonderful (not) world of adult probation. It’s been great to just forget about that part of my life for these past eleven days. It’s been a much needed break. I only left my house once, since I’ve been off, and that was to go to my parents Saturday. I haven’t even gone to the grocery store. I’d make a good hermit, I think. I want to thank you, my online friends, who come to visit and spend time with me here, at my little spot on the web. I noticed that my little blog ended the year with the most hits it’s ever had in one day. I wish you all the best in 2008, and pray for strength & healing for those that are hurting. Randi, I thoroughly enjoyed reading about your progress through your projects last year. I’d be afraid to count all the projects I have here in stages and then to prioritize what to finish….scares me LOL. Have a good day back at work tomorrow and HAPPY NEW YEAR to you too!!!!! I will look forward to seeing all those projects come to completion. Hope your new year is healthy, happy and full of quiting joy.